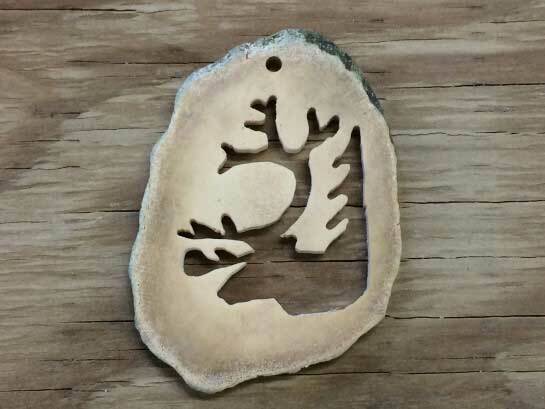 If you are looking for some beautiful Antler Art, you have come to the right place. Our creations are awe inspiring and will give you joy every time you look upon them. You will get compliments from everyone who sees them. 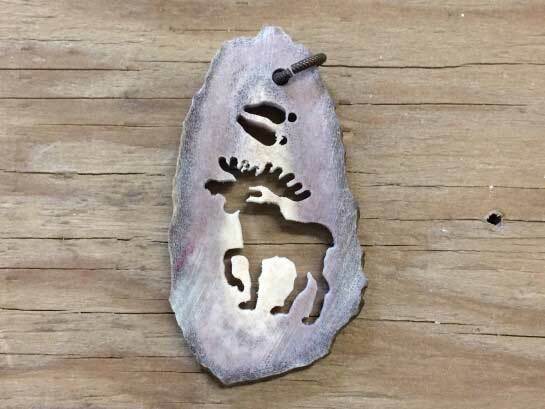 Antler Jewelry is created solely from naturally shed antlers from deer, moose, elk and caribou. The antlers are dropped by the animals every spring after which they grow new ones. You will feel good that NO animals were harmed in the making of our art. The antlers come from the northern hemisphere, above the 49th parallel in North America. Our antler sheds come from British Columbia, The Yukon, Northwest Territories and Alaska. Antlers come in various grades of hardness depending on how long ago the antler was shed and other factors such as species. Moose antler is known to be one of the densest of antlers, and rightly so! When moose fight and tussle they use a lot of power. The older the shed the lighter (weight) it will be due to the drying process. This is important information for those who use antlers for dog chew toys. Deer and elk antler is somewhat porous or softer in the core when compared to moose. Shapes are round, oval, teardrop and or oblong; we don't have control over the shape that antlers come in. 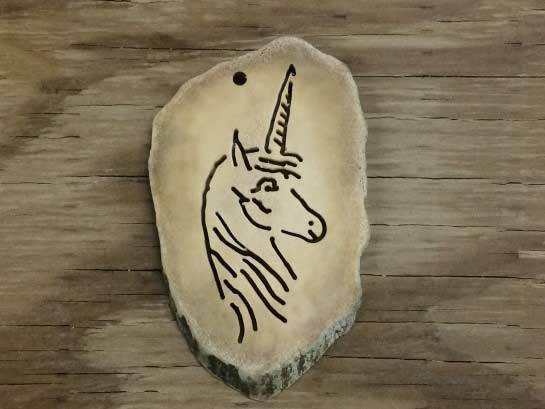 In each size category you will find the various engraved shapes we are offering. 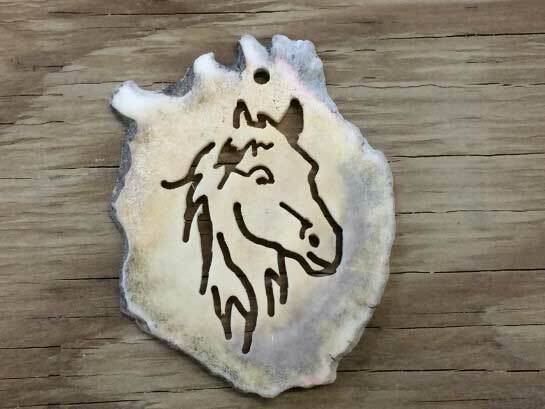 It is possible for us to engrave/cut custom pieces as well. 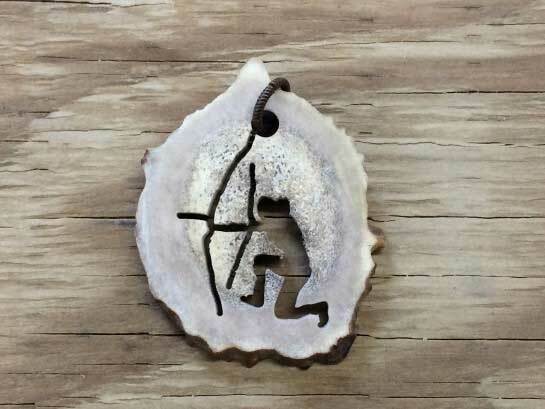 If you have a specific form you would like to see in an antler, please use the form at the bottom of the page to make initial contact with us. 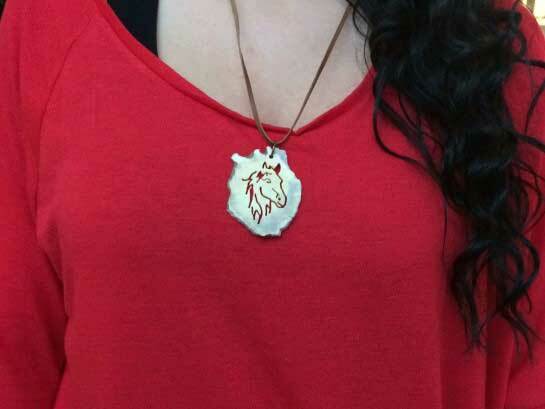 We will do our best to get a medallion to you that you like. Buy One Now! Just select the one you want from the drop down menu. 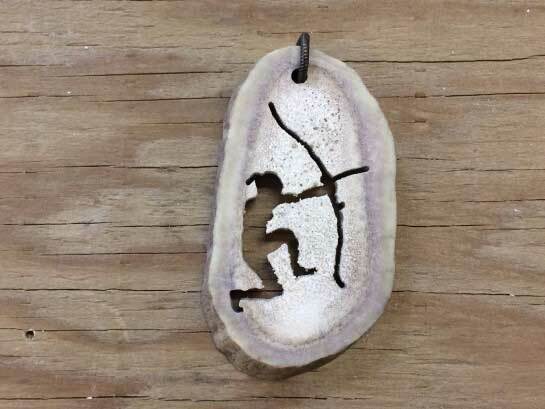 We hope you like our creations and share our page with your friends so they too can enjoy the antler art. 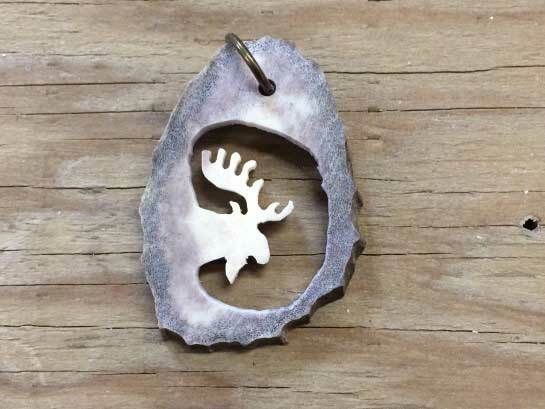 Each antler jewelry carving comes with a ring and 30 inch (76 cm) long leather lanyard. The medallions vary considerably in size and shape, we have dimensioned each one by width and height. Thickness will vary from approximately 1/8 to 1/4 inch (3mm to 6.5mm). 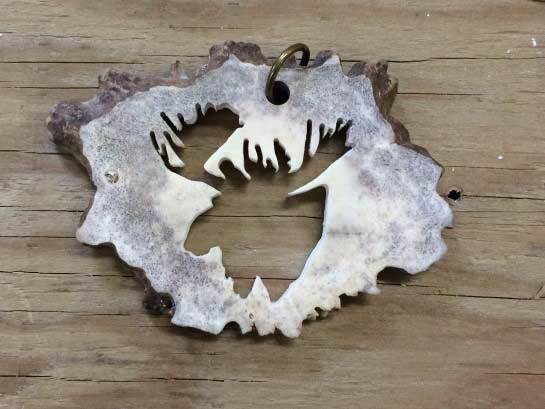 1 7/8" X 2 3/8"
1 3/8" X 2 3/8"
When purchasing these pieces of antler jewelry you are buying the one in the photo, antler sheds are never the same size and shape as you can see in the above photos. These are art pieces and each one is cut out by hand, therefore no two will be exactly the same. If you don't see an image that you like, use the request form below and we will start a dialogue with you to see if we can accommodate the image or type of order you want to fulfill. Of course we would send you a picture or 2 of the item to be sure you are completely satisfied with it! They will be invoiced before they are completed or shipped. Antler Sheds - Where do they come from? You may wonder why deer or moose loose their antlers at all? It is simply a loss of testosterone that starts the process, once the hormone level has dropped to a critical level the antlers will fall off, without harming the animal. Usually bulls (or bucks) with the largest antlers shed first because gravity helps the process so the younger males hold onto their antlers longer. They loose the antlers in spring and grow a new set every year. 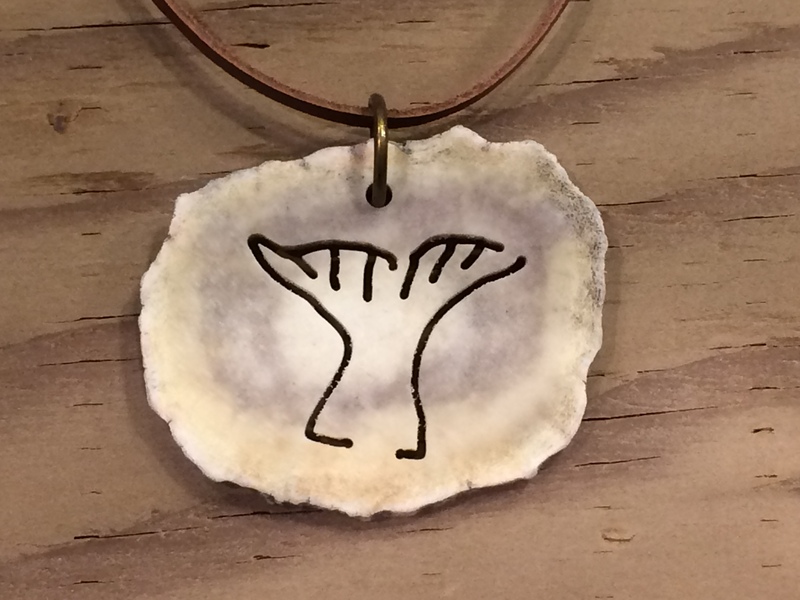 The antler jewelry we currently offer are medallion in shape. 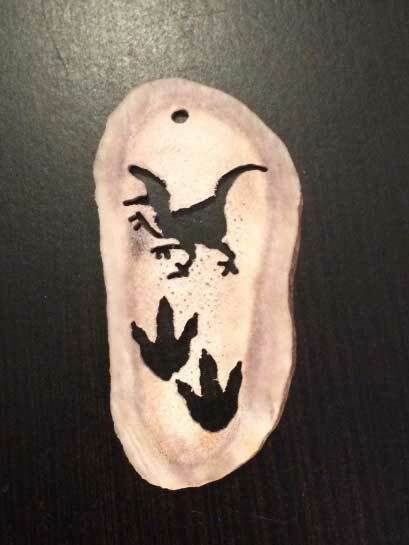 You can use them to hang from your car mirror, decorate your Christmas tree, put them on your desk or simply wear them around your neck. 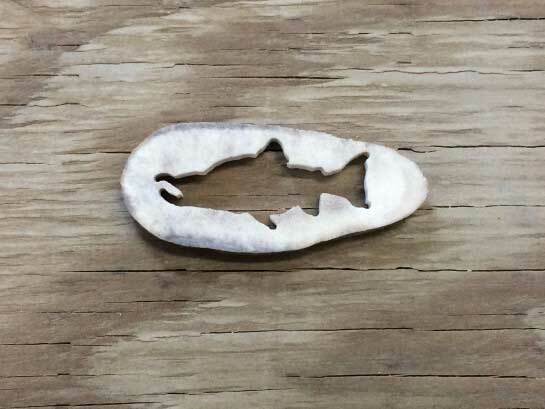 I'm pretty sure you can find other uses for these beautiful designs. Please realize that antlers vary in shape, size and colour. Did you know that animal (deer family) antler colour comes from the trees that they rub their velvet off? 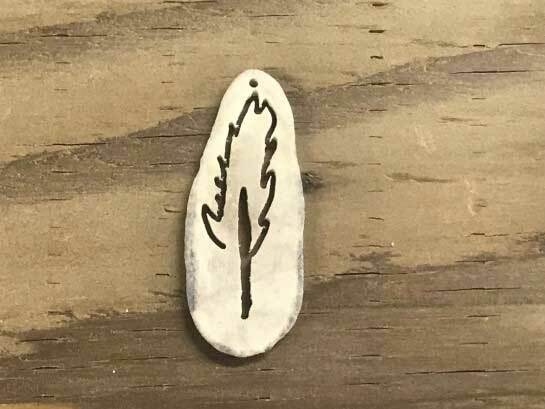 Also, these creations are cut by hand, not machine laser cut, therefore two medallions from the same image may not be exactly the same, but they should be close.